So this icemaker comes with instructions, translated from the original Venusian. I've expanded them so they're legible here. Try not to die laughing. . . .
keep together with other food. without contaminating with other taste of fishy or foul-smell. TO be a complete non-taste & delicious healthy ICE. put into the alcohol or drinks so much com for table & marvellous taste. 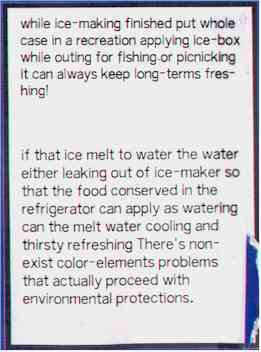 keep in ice-box while outing all suitable for recreation fishing picknicking & baking (Bar-B-Q) applying. 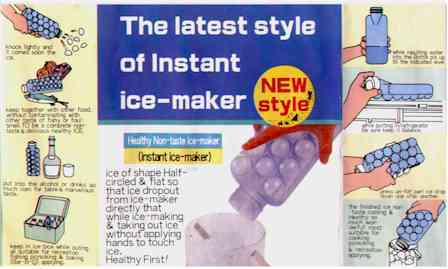 Ice of shape Half-circled & flat so that ice dropout from ice-maker directly that while ice-making & taking out ice without applying hands to touch ice. while inputting water into the Bottle pls. up till the indicated level. while putting in/refrigerator Be sure keep it Balance. press un-flat part ice drop down one after another. the finished ice non-taste cooling & Healthy so much wonderful! most suitable for cooking picknicking & recreation applying.